In 1991, Bhai Balvinder Singh together with his brothers in arms conducted an attack on the Police at the bridge of the Shatrana canal. As a result of this action, several Police officers were killed and the Singh’s were able to escape with all the Police officers weapons. Encounter with the Haryana Police. In the intense five hour encounter, Thanedar Pala Singh and six of his colleagues were killed. Bhai Sahib along with his brothers in arms Bhai Atma Singh Bava, Bhai Jarnail Singh Shatrana, Bhai Nachatter Singh Shatrana, Bhai Trilok Singh and Bhai Mewa Singh Paind managed to escape the encounter unharmed. Bhai Sahib attained shaheedi as a result of a fake encounter. In the small village of Chicherwal in district Patiala, a hero was born who dedicated his priceless life to the Sikh quam and the ideals of Sant Jarnail Singh Ji Khalsa Bhindranwale. Bhai Balvinder Singh Bhinder was born in the year 1966 in village of Chicherwal to Mata Dalip Kaur and Sardar Mehil Singh. Bhai Sahib had four brothers and four sisters of whom he was the youngest. Bhai Sahib completed his primary education at village Chicherwal and went on to complete up to tenth class in village Shatrana. After his education, he went underground and began seva along with Bhai Satnam Singh Samana and Bhai Pipal Singh (A resident of Amritsar district). In 1988 a Police informer told Patran Police Station SHO Lal Singh and ASI Bhajan Singh of Bhai Sahib’s location. 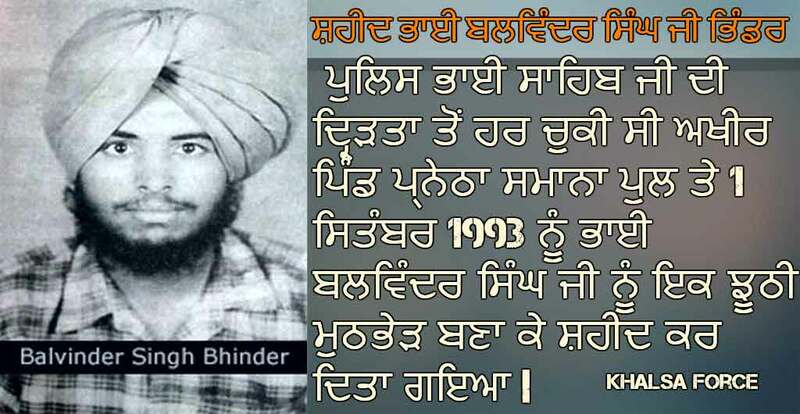 Bhai Balvinder Singh was subsequently arrested and tortured continuously for twenty five days however the Punjab Police were unable to extract any information from him. Following this, the local community put pressure on the Police and Bhai Sahib was eventually released. After his release Bhai Sahib was unable to walk for a while due to the extreme torture and injuries sustained whilst in Punjab Police custody. One day Bhai Balvinder Singh was asleep at home when Bhai Nachatter Singh Shatrana visted him. Bhai Nachatter Singh who has studied along with Bhai Sahib, tested his resolve by asking him: “Balvinder Singh, now what are your views? Bhai Balvinder Singh laughed and replied: “I’m going to continue seva for the Quam” On that day, Bhai Sahib left his home and joined with Bhai Jarnail Singh Shatrana of the Khalistan Commando Force to continue his seva for the Sikh quam. Police Began a Campaign of Terror on Bhai Sahib’s family. The Punjab Police began a campaign of terror and intimidation on Bhai Sahib’s family. Every day they would terrorise the innocent family members at their home. Fearing for their safety, the family were forced to leave their home and go into hiding. Bhai Sahib continued his seva steadfast despite Police efforts to break his resolve. In 1991, Bhai Balvinder Singh together with his brothers in arms conducted an attack on the Police at the bridge of the Shatrana canal. As a result of this action, several Police officers were killed and the Singhs were able to escape with all the Police officers weapons. The Punjab Police were furious at this incident and responded by knocking down Bhai Balvinder Singh’s family home. One day, Bhai Sahib’s older brother Bhai Gurbachan Singh came into the clutches of the Police. Inspector Gurmail Singh of the C.I.A staff at Samana tortured Bhai Gurbachan Singh for an entire month. Unable to obtain any information, they Police put nine cases on him following which he was sent to Maximum Security Jail Nabha. Bhai Gurbachan Singh was released following a three year sentence. In his fight for the freedom of the quam, Bhai Balvinder Singh remained in high spirits. Once, Bhai Sahib and his brothers in arms were travelling from Samana towards the direction of Haryana. When they reached the roundabout at village Maisar, they became involved in an encounter with the Haryana Police. In the intense five hour encounter, Thanedar Pala Singh and six of his colleagues were killed. Bhai Sahib along with his brothers in arms Bhai Atma Singh Bava, Bhai Jarnail Singh Shatrana, Bhai Nachatter Singh Shatrana, Bhai Trilok Singh and Bhai Mewa Singh Paind managed to escape the encounter unharmed. As a result of this action, both Punjab and Haryana Police were hot on the heels of the group and it became their sole focus to find them. After a few days, Bhai Atma Singh and Bhai Trilok Singh were involved in a fourteen hour encounter at village Jaikar in which they both attained shaheedi. After this, Bhai Balvinder Singh began following known Police cats to obtain revenge for his brother in arms. One day, a Singh told him that the Police informers who caused Bhai Atma Singh Bava and Bhai Trilok Singh to become shaheed were making preparations to escape to a foreign country. Along with Bhai Nachatter Singh Shatrana and Bhai Kulwant Singh, Bhai Sahib punished these Police cats in daylight and took revenge for his fallen brothers. This action was also undertaken so that Police informers were aware that their treachery would receive the same punishment. The group then decided to leave Punjab for Uttar Pradesh. The Police managed to send some cats with the outward appearance of Sikhs behind these true Singhs to Uttar Pradesh. The Police used these greed motivated individuals as they were able to recognise the Singhs and report back to their masters. When Bhai Balvinder Singh was getting off the bus from Bareilly at the station of a village, the informers recognised Bhai Sahib and got him captured by Punjab Police. At this time, Bhai Jarnail Singh Shatrana was not recognized and was able to escape. 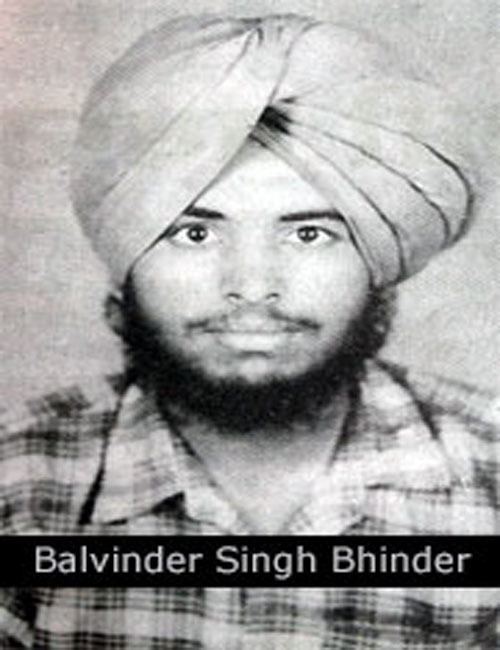 When Bhai Balvinder Singh was captured by the Police he attempted to consume a cyanide capsule but was not successful. He was taken from Uttar Pradesh to Punjab. He was then taken to C.I.A staff Samana where he was heavily tortured for information on his brothers in arms. Bhai Sahib remained strong in his resolve and the Police were unable to obtain any details on the Singhs or their jathebandi. Finally on 1st September 1993 at the bridge of village Panetha, Samana, Bhai Sahib attained shaheedi as a result of a fake encounter. ਭਾਈ ਨਛਤਰ ਸਿੰਘ ਜੀ ਨੇ ਭਾਈ ਸਾਹਿਬ ਜੀ ਨੂੰ ਵੇਖਿਆ ਤਾਂ ਕਿਹਾ ਸਿੰਘਾਂ ਸੋਂ ਰਿਹਾ ਹੈ ? ਉਠ ਚਲ ਕੌਮ ਵਜਨ ਮਾਰਦੀ ਹੈ ਦਸ ਹੁਣ ਕੀ ਵਿਚਾਰ ਹਨ ?